Welcome to Butterfly Landing! Sleeps up to 6 guests including children. Spacious and comfortable, this Pacific Grove vacation rental affords a family lovely bay views and access to the many area attractions. The Monterey Aquarium is only a 5 minute drive. Enjoy walking through the moss-covered oaks and bring your dog to take part in the fun! 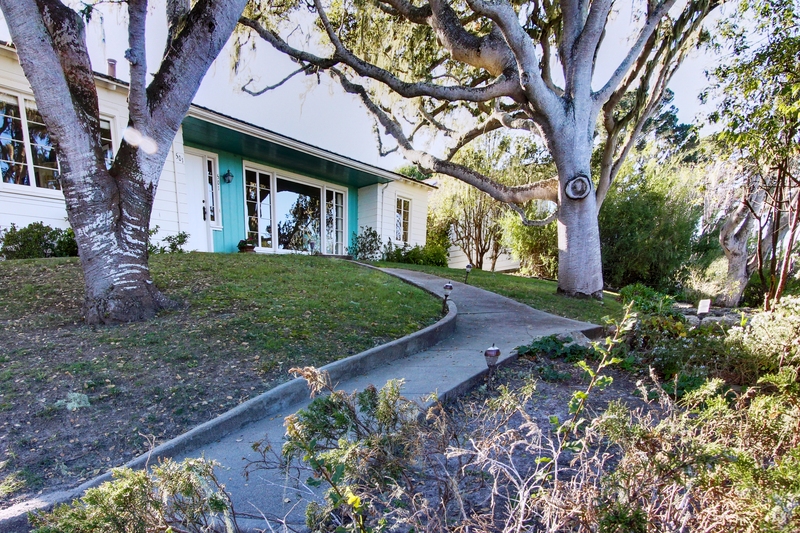 Situated near downtown Pacific Grove and Monterey Bay, this single-level, three-bedroom, 1400 square foot home on a large, double corner lot retains a vintage feel but offers many modern amenities. Walk up a winding path under the trees to the lovely entryway and you'll find a living room with hardwood floors, a coastal-fabric sectional and even an upright piano. A nautical theme is found throughout the home via vintage photos, ship models and original seascape paintings. Enjoy a warm and contented evening by the gas-burning fireplace or watch a movie on the TV. The dining room has a built-in settee with seating for six, as well as a large bay window overlooking the oak trees with distant bay views and beautiful sunsets. The kitchen offers a ton of natural light, vintage cupboards, stainless steel appliances including a professional range and oven and a dishwasher to make cleaning up a breeze. 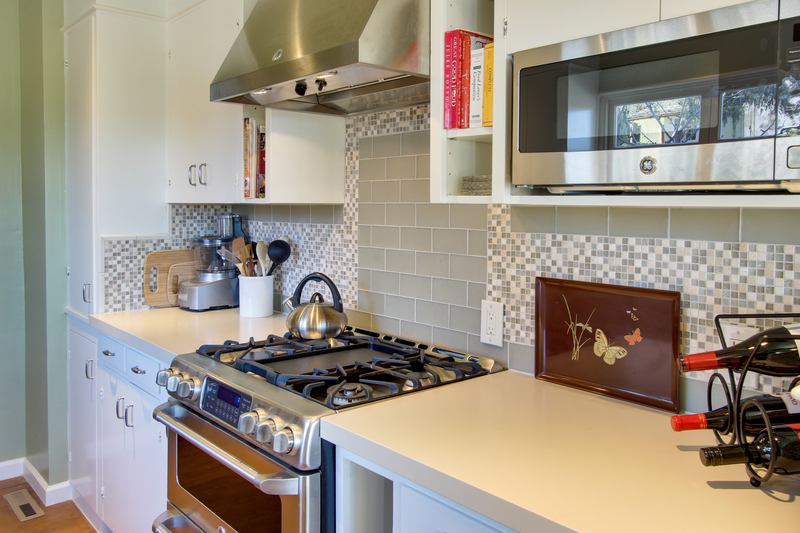 Any home chef will delight in the plentiful kitchen accoutrements. Three cozy bedrooms offer enough space for six guests. The master bedroom features a California King Bed with luxury bedding. The second guest bedroom offers two twin beds, perfect for a couple of teenagers or young friends. 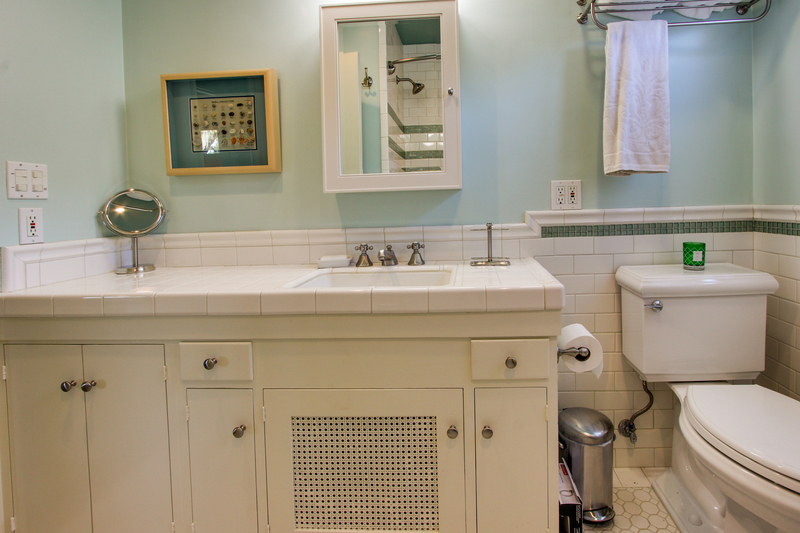 The full hall bath is located between the first two bedrooms and features vintage subway tile and light blue walls. The third bedroom has a queen bed, colorful coverlets, wood furniture, large windows and is separated from the other two bedrooms by the living areas. 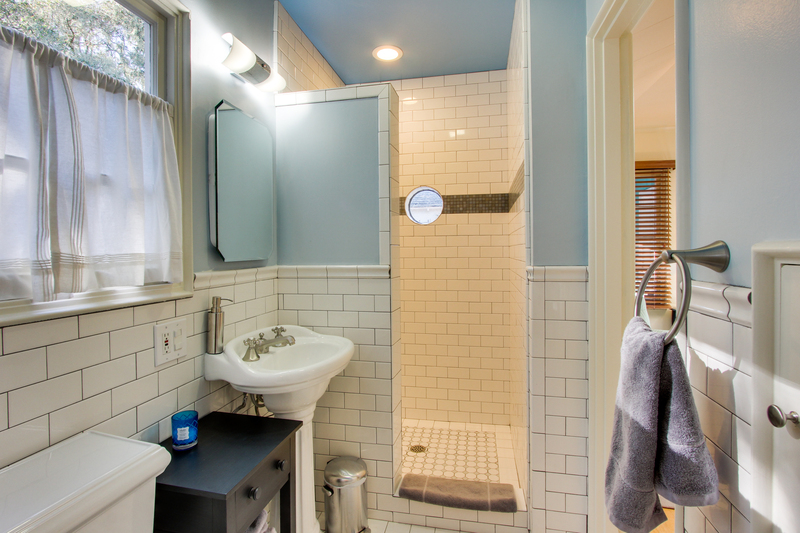 A second bathroom with standing shower is accessed via the third bedroom and a hallway near the kitchen. Both bathrooms have radiant heated floors which feels fantastic on your feet on those perfect cool Monterey nights and mornings. 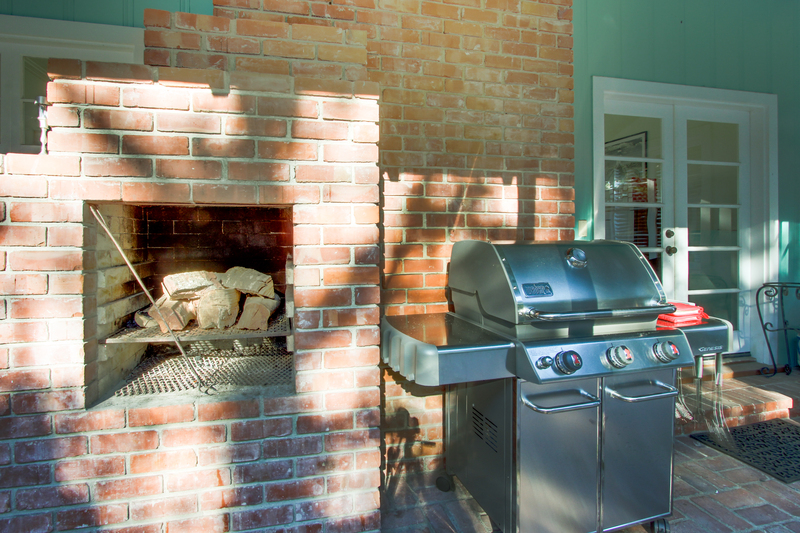 The enclosed backyard features a spacious patio, wood burning fireplace and a gas grill where you can enjoy an al fresco dinner any time of the year. A washer and dryer are available, as is free WiFi. The Central California Coast boasts natural and man-made wonders. Enjoy the stately Victorians in Pacific Grove or take a stroll toward Asilomar State Beach to watch the monarch butterfly migration. Popular Monterey Bay Aquarium is just a mile away as well. The home is equipped with beach towels, chairs and an umbrella along with plastic ware to take to the beach for picnics. Parking is available for 2 cars in the driveway and plenty of on street parking. The garage is not available for guest use. 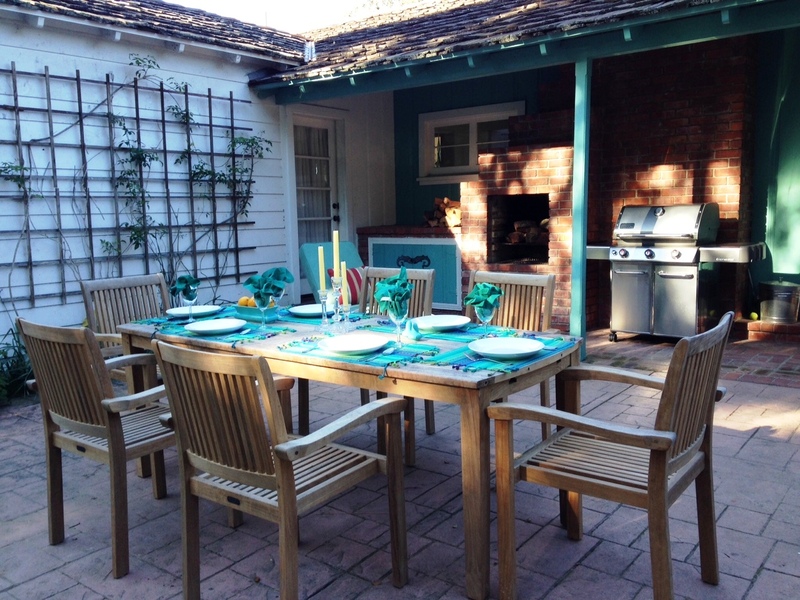 Enjoy a peaceful coastal respite at this charming Central California Coast vacation rental! Guests Stayed february 2019 ~ Reviewed on HomeAway ~ 5 out of 5 Stars! "Beautiful property and wonderful location! I have stayed at many VRBO properties. Butterfly Landing is by far, my favorite. It was so warm and cozy. It was a chilly week, and the fireplace was a wonderful touch. The placement of the bedrooms gives much privacy. The common rooms, such as the living room and kitchen were warm and inviting. Kitchen inventory was incredible with everything you would need to cook a wonderful meal. The dining area is the best seat in the house and we all spent many hours soaking up the sun and watched beautiful deer as they wandered through the neighborhood. We were visiting my Air Force daughter who is studying the Arabic language at the near by Defense Language Institute. She was able to visit and bring some of her classmates and we enjoyed hamburgers and hot dogs on the grill; Wonderfully serenaded with two of her classmates playing the piano in the living room. It was wonderful! We will return next year for my daughter's graduation. There is no better place than the comfort and warmth of Butterfly Landing." Guests Stayed november 2018 ~ Reviewed on HomeAway ~ 5 out of 5 Stars! "Beautiful, comfortable, convenient location! Our family of 5 was very comfortable and had a great stay. The kitchen was great for cooking, we had plenty of space, the backyard was perfect for our small dog. The location was very convenient and parking was also free and convenient." Guests Stayed october 2018 ~ Reviewed on HomeAway ~ 5 out of 5 Stars! "I would love to own this house. This is such a great house for a small family - worked great for my daughter, two kids and Nana and Papa - us. Close to everything, and the school/park across the street was a plus. We had everything we needed and it was so very comfortable. Beach towels, beach chairs, toys and children books were a plus. Even wonderful bath robes which my daughter enjoyed! The deer wandering through the alley was a joy for the children. Although I just wanted to feed and water them! We will be back!" Guests Stayed may 2018 ~ Reviewed on HomeAway ~ 5 out of 5 Stars! "Perfect Beach House! The house was in a great location, amenities were great, house was clean, and the property manager Brandon provided wonderful service. We are looking forward to visiting this house again." Guests Stayed july 2017 ~ Reviewed on HomeAway ~ 5 out of 5 Stars! "Cute comfy house! My family loved our stay at Butterfly Landing. The house is cosy and very attractive. 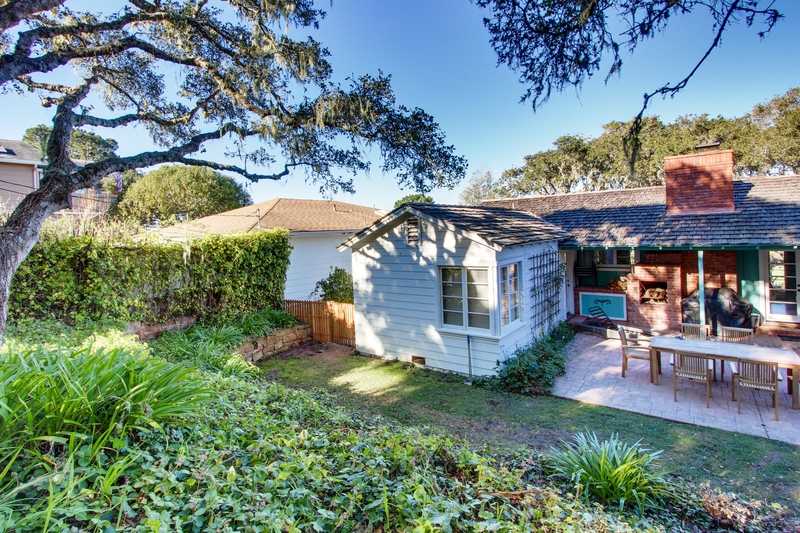 Combines the charm of an older Pacific Grove cottage (a rotary dial landline!) with totally up to date and comfortable appointments--great beds and linens, first class kitchen equipment, tv and wifi, and a great assortment of board games. The peak over the trees at the water is lovely, and one morning we saw deer on the school track across the street. The house is very clean and well organized and Sanctuary does a great job of providing information about the area." Guests Stayed june 2017 ~ Reviewed on HomeAway ~ 5 out of 5 Stars! "Wonderful! Beautiful peaceful home in a lovely neighborhood. I like everything about this home. Very pretty huge yard and every night a deer family visited the front yard. Peaceful and off the beaten path." Guests Stayed May 2017 ~ Reviewed on HomeAway ~ 5 out of 5 Stars! "Comfy, Cozy and Charming! We enjoyed celebrating Morher's Day weekend at Butterfly Landing! From the moment we walked through the quaint garden and entered the home, we all agreed that this was the perfect rental for our extended family. My young granddaughters loved playing the piano and reading the books in the children's room. The layout was perfect for allowing my daughter and her family privacy on one side of the house while another daughter and I shared the master bedroom. We enjoyed sitting at the breakfast nook and watching squirrels frolick and deer graze in the front yard. The area was very quiet and the accommodations were comfortable. The home is conveniently located as we enjoyed running along the coast and going to the aquarium. The best part was being able to bring our dog to share in the family adventures! 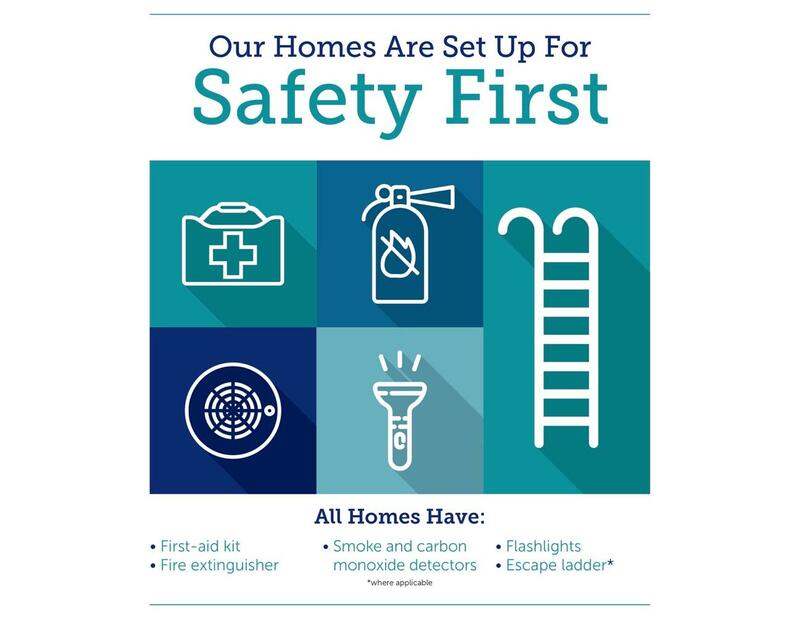 The staff at SanctuaryVR was very helpful and provided all of the information we needed to access our home immediately upon arrival and to check out. Candace even sent a text after we arrived to make sure all was well. We would definitely rent this home again!" Guests Stayed March 2017 ~ Reviewed on HomeAway ~ 4 out of 5 Stars! "Very comfortable house, nice neighborhood! Everything was as shown in the photos. Manager responsive. Perfect stay." Guests Stayed October 2016 ~ Reviewed on HomeAway ~ 5 out of 5 Stars! "Wonderful! From the moment we arrived, Butterfly Landing felt like home. It was the perfect location to my daughters apartment and close to town and the beach. It has a amazing view. The back yard was cozy and private. It had all the amenities we needed, great towels, games, a wonderful gas fireplace and more! We will definitely stay here again and soon I hope!" Guests Stayed July 2016 ~ Reviewed on HomeAway ~ 5 out of 5 Stars! "Didn't want to leave!!! We could have stayed at this home forever! it had all of the necessities we needed with a young family. the boys room was stocked with games and activities and the outside patio was so relaxing with the fireplace and fenced in yard. we enjoyed going for walks in the neighborhood with the great school and track across the street. We cooked most meals at home and the morning sunshine through the kitchen windows was beautiful while cooking breakfast each day. The beach Decor is beautiful and reflects the spirit of the Monterey area. the home is literally three minutes from the aquarium so it was very convenient for our family.I would definitely stay here again and look forward to our next adventure." "Great home and location! This is an immaculately maintained home in a very quiet location. The home is spacious and comfortable, tastefully decorated, the kitchen is first-rate, and the beds are extremely comfortable. The home centers around the living space, both indoor and outdoor; basically, it's just a great, comfortable, quiet space, a delight to be in. Downtown is less than a mile away, easily walkable if desired. Highly recommended; frankly, we'd live here." 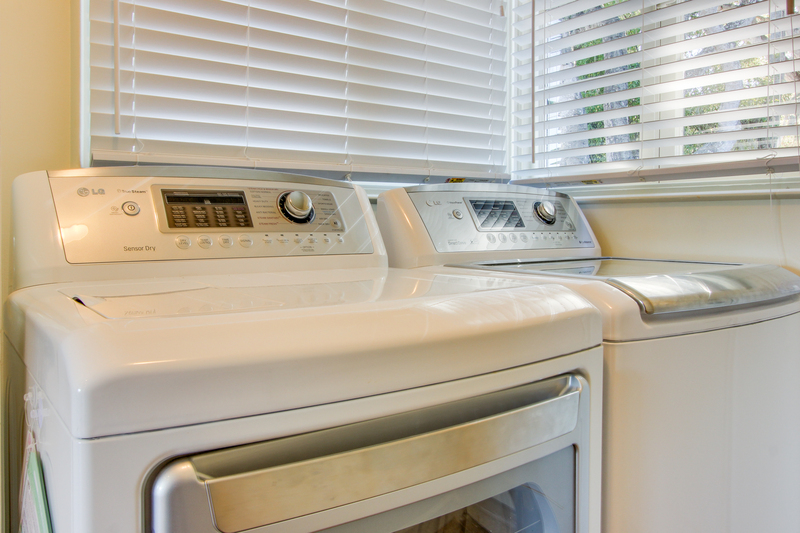 "The home was clean, comfortable and well appointed. The kitchen is well stocked for ease of food preparation. Plenty of games for grown-ups and kids alike. Great fenced in back yard and nicely landscaped. I love the decoration of the home as they blended antiques with neutral and nautical details as well. Comfortable seating for 6 adults was a plus! Great location and close to everything by car". Guests Stayed April 2016 ~ Reviewed on HomeAway ~ 5 out of 5 Stars! "Great stay at Butterfly Landing! We had a family emergency that required us to be in Pacific Grove for a week. This came up with very little notice so we appreciated the ease with which we made our short notice reservation. It was wonderful to be able to connect with a live person on a Sunday morning! The house was even better than the pictures led us to believe. Very clean, extremely comfortable beds, and a kitchen with everything we needed to cook a variety of meals! We felt right at home, which made a difficult time so much easier. We had absolutely no issues with the house, and would jump at the chance to stay again! Highly recommend!" "We loved staying at this cute house in Pacific Grove. The location was great. Right near the entrance to the 17 Mile Drive and very close to the Monterey Bay Aquarium and Cannery Row. The house itself was adorable. Very comfortable for four adults and one child. The kitchen was great and had everything you could need. The living room was big and comfortable. We enjoyed the board games and even played the Wii U. All nice touches! The beds were comfortable and the bathroom even had heated floors. We would definitely stay here again and are already planning a trip back." "Even though the kitchen and bathrooms had been remodeled, the home maintains its original charm." "We love everything about this house! The location of the house is great. Very clean and beds are comfortable. Our children enjoyed the Wii U so much. We will come back for sure!" "We really enjoyed our time at Butterfly Landing. Quiet neighborhood, close to everything! House is very quaint, clean and relaxing. Will definitely rebook this lovely vacation home!" "The amenities of this house are many: it is tidy, clean and bright with many windows, the heated bathroom floors and a fenced yard for my 27 month old grandson offered a change of pace from being in the house and out exploring the Aquarium and Dennis the Menace Park. The box of action figures and the castle were an unexpected find and great entertainment. The parking off street was good and the landscaping pretty to look at. Several grocery stores are nearby as are restaurants with take-out service. A very comfortable place to stay." "Our party of 6 (2 adults, 4 teenagers) booked this because 3 separate hotel rooms would have been way to expensive. We always stay in Monterey over the Thanksgiving break and in we past we always stayed in hotels next to the beach. Did we miss that? Honestly - no. The house has a great vibe to it, beautifully renovated, old and yet new, very spacious bedrooms and a great living room to hang out. Beautiful kitchen with nice big table and window seats - I'm sure you could do a lot of good cooking there, which we didn't. 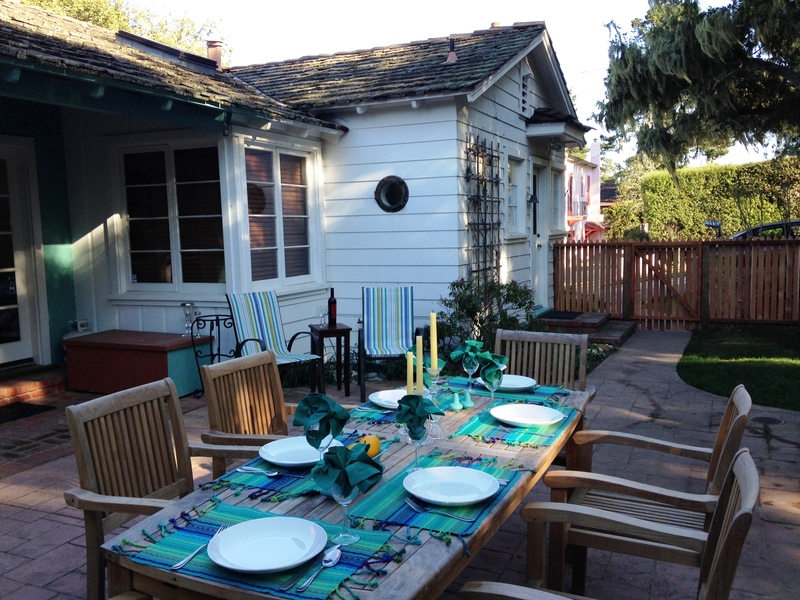 Backyard and dining table outside are very inviting too. Loved the fact that we lived in the middle of a quiet residential neighborhood and enjoyed being able to walk to the aquarium, Cannery Row and Pacific Grove restaurants." "We felt at home and fell in love with this place. The house is well kept and it has basically everything you need. Its very quiet and relaxing. Its literally a few minutes away from the beach, 17 Mile Drive, aquarium, Cannery Row and Fisherman's Wharf! Im so glad I found this place!!! Highly recommended!" "Great accomodations, cleanliness, appliances, location and service! Our children and us were truly feeling happy at this house. Want to come back again!!!" "Everything in the house was well kept. Everyone enjoyed the surroundings, the views and restful sleep. What a great surprise to see deer in the backyard which makes this a wonderful experience to see them up so close. We all hated to leave and hope we can come back soon. Thank you for a great stay." "Butterfly Landing was oh, so comfortable for my family! The details were beautiful and very enjoyable. From the warmed bathroom floors to the old recipe box, so new and old, so comfy!! The upgraded 1940s kitchen was were I spent most of my time and I quickly felt at home- retro petfect. With 4 kids, I cooked a lot. Cooking in a well stocked, beautiful kitchen was vacation with a beautiful view. The hubby happily BBQed. The dining room table was perfect for our card games. The kids were in heaven with the big couches, wii, soft beds, and backyard. I almost stayed and sent my kids to school, across the street :-) Neighbors were quiet and kind. We wanted to stay... Thank you for offering such a nice family home for our vacation." "A beautiful 1940s home. Many original features with the kitchen and baths fabulously remodeled to compliment the original details. The home is beautifully maintained and very comfortable. In a close-to-the-action yet quiet neighborhood! We will stay there again!!" "Our family (2 adults, 3 children) spent a week in this lovely property in Pacific Grove at the end of March 2015. We had never vacationed in the area and wanted to spend our time in a great house that was close to everything. We found exactly that in Butterfly Landing! The house was very well stocked with any and everything that you could think of. Our favorite things about the house: The Wii (the kids loved it and it gave Mom and Dad time to chill), the snuggly blankets in the living room (we bought a few for our house! ), the piano (our kids are taking lessons, so having it there was great! ), the backyard was just gorgeous too! We have not one bad thing to say about the rental. We enjoyed every minute of the time we spent in the great location! 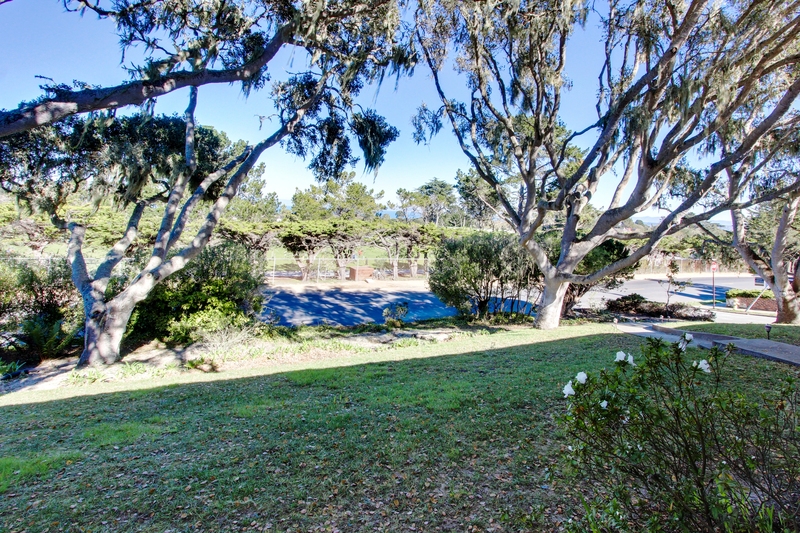 It is just a few blocks away from the beach and Downtown Pacific Grove. You can even walk to the Aquarium!" "A total 4 star rating. What a wonderful experience. Thank you so much!" ~ Joe C.
"My family of five absolutely loved this house! It was perfect -- clean, fully stocked kitchen, oh so comfortable beds, plentiful linens and towels, great outdoor eating/grill area, Wii for the kids, spacious and comfortable rooms. We couldn't have been happier with this house and highly recommend it! It was hard to leave." "This was a last minute rental for us and we were very pleasantly surprised by how beautiful the house is. Great furniture - great condition, very comfortable. Really the best rental!" Note: There is an adjacent bathroom with standing shower near this bedroom that is accessed both from inside the bedroom and a hall. 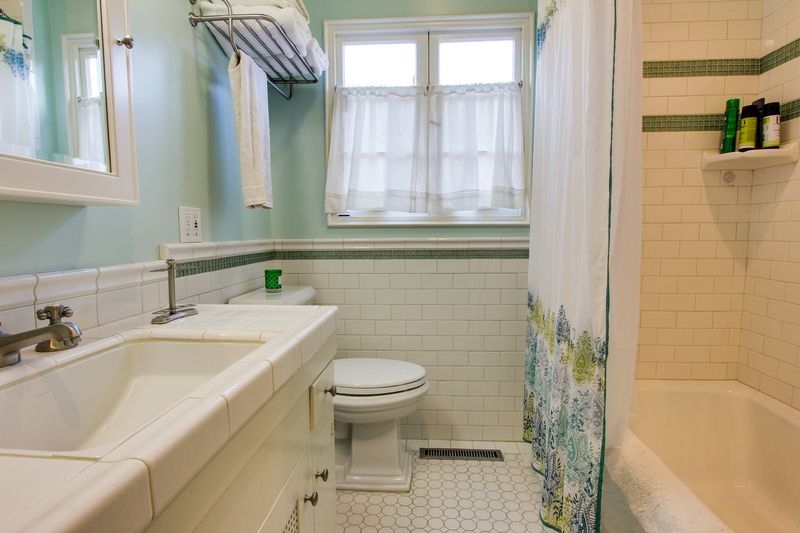 Note: A second hall bathroom is located between bedrooms #1 and #3 which has a shower-over-tub.